Boniface of Mainz | "Northern Crossings"
There are things that slip through the cracks. 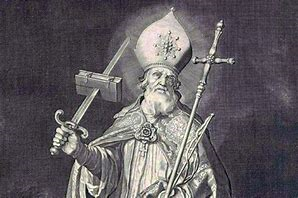 I was looking to get my hymn list done for the summer and I looked at my calendar and saw that June 5 was the commemoration of Boniface of Mainz, “missionary to the Germans”. I remember reading something about Boniface but I couldn’t remember much of what I read so…. His name was Winfrid (“friend of peace”), I’m not sure that bullying was as big of a deal in England around 680 A.D. as it is today but I cannot imagine any salutary effects of having that name.. He was probably called “Winnie”. but he became Boniface, the Apostle of the Germans, and therein lies a tale. I have pieced this together from a book entitled “The Life of St. Boniface”, by George Robinson and some articles on the internet. Winfrid was one of the great missionaries of Church history. Legends usually have some basis in facts and the missionary accomplishments of Bishop Boniface are well established in history. Upon these known facts have grown some legends. Among the legends of Boniface are the story of his chopping down the great Oak Tree of Thor. Because of him people light candles on nativity wreaths and hang presents on Christmas trees, at least that is what some think. We will get to that shortly. So the miracles start early when God scares his old man to death by bringing him close to death. Winfrid goes to the monastery and applies and is accepted and Robinson never tells us if the old man died or if he recovered. His part of the story is pretty much over and Winfrid starts his education. He hadn’t been there very long when he starts to ask his superiors if he can go and preach about Jesus to those far away who had heard and forgot, or to those who heard and were persecuted, or to those who had not heard about Christ at all. Their answer was that he would have to study first and he did. This is an impressive fellow even if his name is bit “iffy”. Missions and mercy are the chief interest of this blog and we are going to be studying this missionary for awhile. His life is as they say, is a gripping good yarn. More tomorrow.